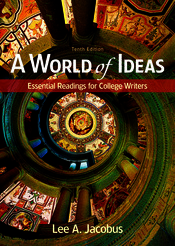 The first and bestselling reader of its kind, A World of Ideas introduces students to great thinkers whose ideas have shaped civilizations throughout history. When students hear names like Aristotle, Martin Luther King, Jr., Virginia Woolf, or Sigmund Freud, they recognize the author as important — and they rise to the challenge of engaging with the text and evaluating it critically. No other composition reader offers a comparable collection of essential readings along with the supportive apparatus students need to understand, analyze, and respond to them.